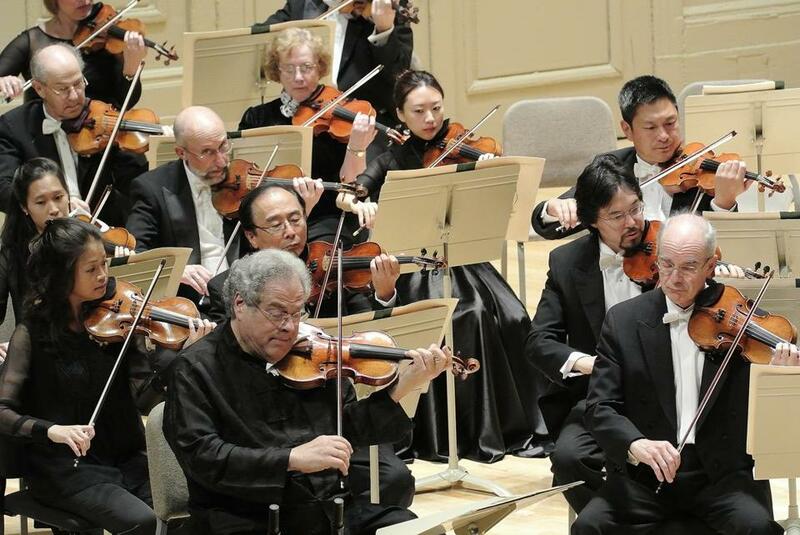 Itzhak Perlman (foreground) helped the Boston Symphony Orchestra open its season Saturday night. It came up once more on Saturday in Symphony Hall, that age-old question: Should a big orchestra’s opening-night program be a frothy glass of musical champagne or a substantial sit-down meal that hints at the artistic aspirations of the season to come? At his most wizardly, former music director James Levine could make an opening night feel like both. But since his departure, the Boston Symphony Orchestra has been reaching for the bubbly in late-September: short ultra-conservative programs uncorked by celebrity violinists. Last year it was Anne-Sophie Mutter in all-Mozart repertoire, this year Itzhak Perlman in all-Beethoven. The virtues of this approach are obvious. The halls are full. The ovations are robust. The music goes down smoothly. The downside comes not in these programs themselves but in their placement at the very top of the season, essentially conferring on these nights a symbolic weight that their artistic profiles do not support. The New York Philharmonic this year devised what seems like a no-brainer solution to this dilemma, in essence having its cake and eating it, too. That orchestra scheduled its ceremonial gala concert (as it turns out, also featuring Perlman) to take place after the artistically meaty opening subscription program. This seems to me like an ideal compromise, one that addresses the appetites of an orchestra’s multiple constituencies. Meanwhile back at Symphony Hall, Saturday’s program began with Perlman leading the orchestra as soloist in Beethoven’s two modestly proportioned Romances for Violin and Orchestra. Perlman’s bow arm is not as infallible as it once was, nor his tone as plush, but he projected these works straightforwardly and with his customary sense of the music’s singing line. The stage was then quickly reset and Perlman traded his violin for a conductor’s baton. These days conducting takes up a significant portion of Perlman’s time, and through the years he has improved at it, too, though it’s safe to say that his legacy as a violinist is at no risk of being overshadowed by his achievements on the podium. Saturday’s account of Beethoven’s Seventh Symphony came off better than one might have feared, with the best saved for last — the finale was full of vigorous energy and taken at a very brisk clip (timpanist Timothy Genis’s playing was a marvel of precision and drive). Even so, Perlman did not seem to have much to offer by way of big-picture structural ideas about this score, and the phrasing and textural detail in the first three movements lacked the clarity and rhetorical force that is well within this orchestra’s reach (some unbalanced and wayward horn playing also marred the first movement). On the most basic level, however, the BSO’s collective virtuosity in this repertoire is by now essentially hard-wired, and its brilliant playing in the finale brought the hall swiftly to its feet.